Bigger is better, right? It certainly was for the GSX1100E. 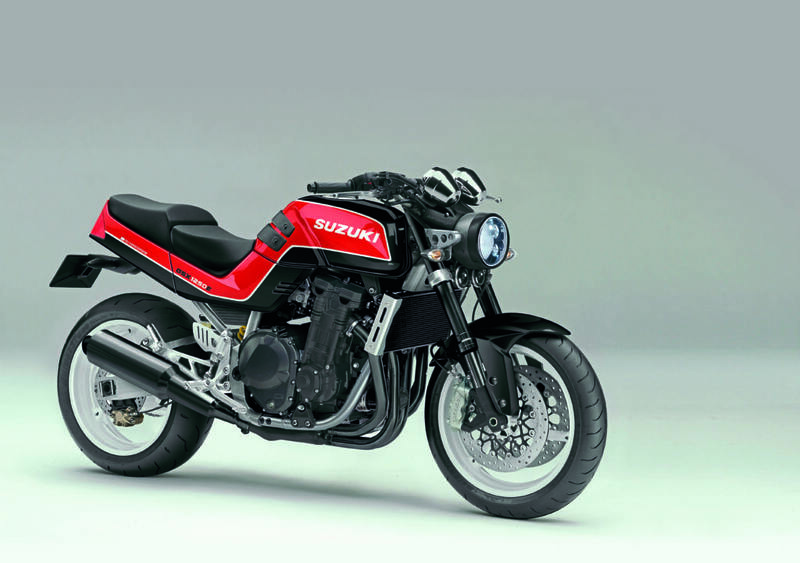 Superseding the two-valve GS, the 1980 litre-sized GSX boasted the TSCC acronym (Twin Swirl Combustion Chambers for a more effective bang), angular styling, and a claimed 100bhp to become the fastest production bike of the era. 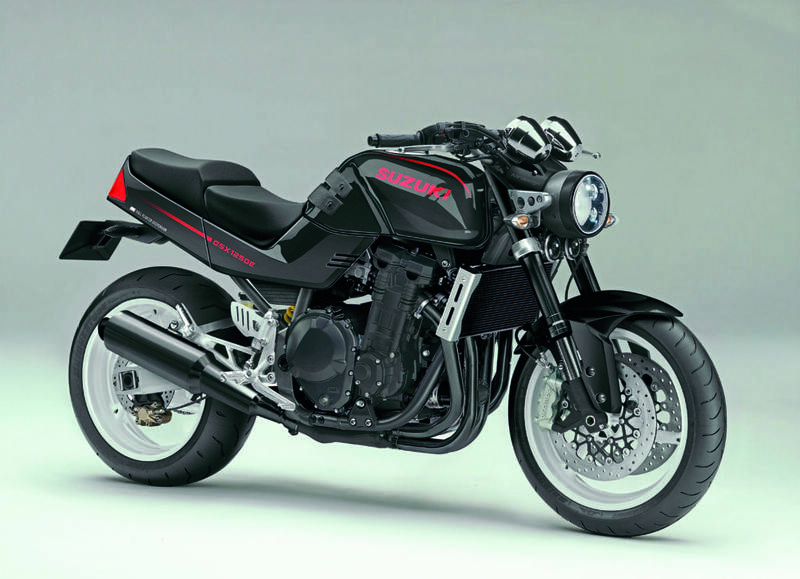 By 1988 it had shed the twin shocks, grown to an 1150, swapped wheels and frames and was now making a claimed 125bhp. It had the 11-second go to match the muscle-bike show and was the weapon of choice for drag racers across the land. Available in faired, half-faired and un-faired flavours, it was the most comfortable way of winning the traffic light GP. We’ve given the purest naked 1985 monoshock version a virtual makeover for 2017. The 1984 bike had a frame that was a box-section cradle where you could see it, but tubes where you couldn’t. We’ve been decisive and gone for thick old-fashioned tubes and junked the odd-sized wheels (the original went from a 19in to a 16in front…) for lightweight three-spoke 17-inchers which will give this reboot an agility advantage. Holding these to the ground are upgraded 43mm big piston upside-down forks – up from the spindly 36mm Kayaba units of the original. The old 275mm discs are swapped for 320mm items mated to radial Brembos from a GSX-R. The ally box-section swingarm is braced for that muscle-bike vibe. 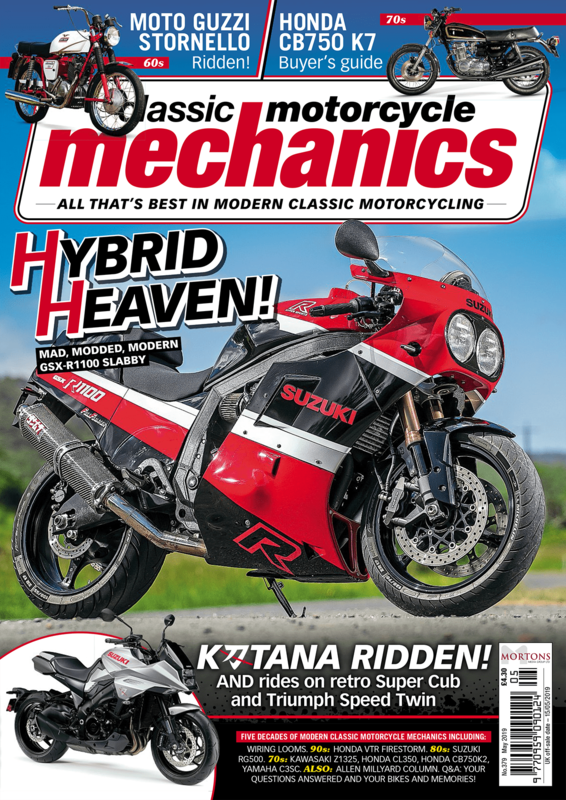 While the last air-cooled GSX1150 made a claimed 125bhp and the more recent fuel-injected, water-cooled 1250 Bandit motor made a lower 95bhp, there’s little argument the modern Bandit engine is the one with the potential. As stock it’s a ticket to Torquesville without any stops in-between – a beautiful motor that reassuringly gives that arm-pulling sensation from anywhere on the tacho. With some minor tweaks we’d envisage a healthy 135bhp. As we’re all friends here we won’t mention Euro 4 compliance. The bodywork remains mostly faithful to the 80s bike which means it retains its handsome Tonka toy simplicity and aggressive poise. Weight-saving LEDs torch the way at the front and allow the headlamp to be more compact. You’ll see with these lights, unlike the original’s: and we’ll see you at the lights. Ready, steady… GO! What do you think? Should Suzuki reinvent some of their coolest bikes in this way? Let us know!